Harley Quinn #55 Review – AiPT! Nothing’s worse than spending the holidays with your uninvited, unannounced family—just ask Harley. It’s that time, Harley’s Christmas Special’s here. Everybody knows, there’s not a better time of year. Hear that slay? Harley’s on her way. 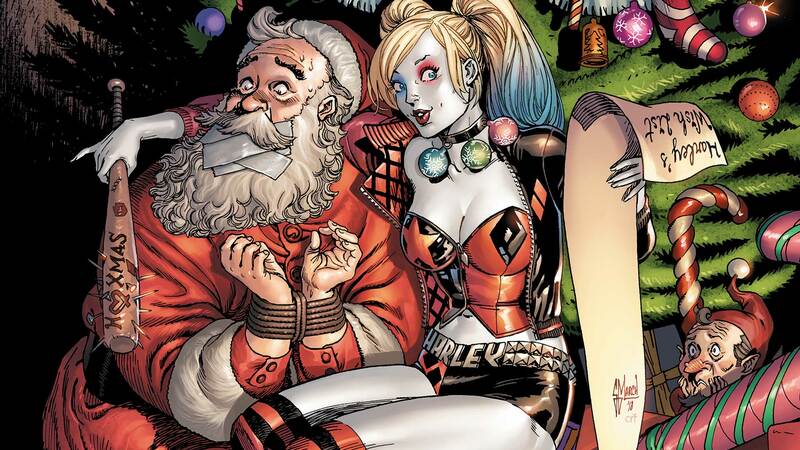 Hip, hip hooray for Christmas Vaca- ahem, I mean Harley Quinn #50! Christmastime possesses this wonderful dichotomy of being both one of the most magical times of year and also the holiday season known for inspiring epic, Jerry Springer level family free-for-alls. Sure, your family could have the best of intentions for making the season merry and bright, but who doesn’t have firsthand experience of a politically fueled rant from your intolerant Uncle Buck leading to stylish WWE theatrics on the dining room table? In Harley Quinn #55 Sam Humphries and John Timms seek to explore these popular holiday tropes with the supervillain-turned-anti-hero’s family. Will Harley find out that It’s a Wonderful Life or is this just going to be another Christmas with the Kranks? In a time when superhero comics focus on grandiose themes surrounding the construction of the multiverse or dark character deconstructions, Sam Humphries and John Timms’ work on Harley Quin #55 is a breath of fresh air. Through embracing the absurd, comedic aspects of the season, Humphries has constructed an enjoyable tale that is relatable for every reader. At some point in our lives, we have all endured the Clark Griswold experience. Between unruly pets eating electrical wires and misguided in-laws dumping their explosive feces into our sewer drains, sometimes our family can make our homes feel like the threshold to hell. Humphries wisely channels this comedic energy into Harley Quinn #55. Harley Quinn’s nutso family has invited themselves into her home to celebrate Christmas. Amid destroying her interpretive ice sculpture with Death Metal, ruining her massive meal with drones, and destroying her replica chair from the movie Santa Saves the Multiverse, her father and brothers each find a way to ruin Harley’s Christmas celebration. At one point, I found myself chuckling as I wondered how things could possibly get any worse. Then, her pyromaniac little brother torches the tree to make it prettier. (At least we’re spared here from the literally explosive diarrhea of Christmas Vacation.) Oh, and, without spoiling the family’s secret, it does get much worse. What makes each of these moments work is Humphries’ illustration that these are not (entirely) evil individuals bent on the destruction of her Christmas Festivities. Instead, each of these moments illustrate how things can go terribly wrong in spite of our best intentions. I think that this theme will resonate with all of us as many of us will try to make Christmas special for our loved ones. Additionally, Sam Humphries wisely uses “family” an overarching theme for the issue. Whether or not our family makes us feel like we’re in the seventh circle of hell, we still love them and would do anything to support each other when needed most. John Timms’ art does a great job telling the story. Timms’ pencil work is perfect for conveying Harley’s range of emotion as her Christmas Celebration, and world, crashes down around her. Additionally, some of the panel work helps Harley break the fourth wall by pulling the reader into the issue. I would also be remiss if I didn’t mention Sam Humphries’ wonderful grasp on Harley’s dialect. This helped create a more engaging reading experience as I found myself reading the dialogue in Arleen Sorkin’s voice. There are a few moments in the Harley Quinn #55 that feel out of place when compared to the rest of the narrative. Many of these moments are used to set up the conflict in future issues. However, they are not entirely distracting because I think you can get away with random story development with a character like Harley. Moments that come out of left field don’t feel strange when you’re dealing with a character that can break the fourth wall. Overall, Sam Humphries and John Timms have constructed an entertaining Christmas Special with Harley Quinn #55. By embracing the more absurd, comedic elements of the holiday, and focusing on themes surrounding family, Humphries’ tale never betrays Harley’s character yet is still is relatable for most readers. Unfortunately, a few story beats only serve to set up future conflict and do not fit into the overall narrative. Harley Quinn #55 is a breath of fresh air that embraces the absurd, comedic elements of the holidays while remaining focused on family. Sam Humphries' Focus on the absurd, comedic aspects of the holidays. John Timms' art convey's Harley's energy and emotion well. There are a few moments that don't serve the issue's larger narrative.